Welcome to FunnyExam.com, a collection of funny test and exam answers with the associated comments from the students' teachers. If you are a teacher, student or parent submit your funny exams for inclusion on the site. Hahahaha I love this, teacher win!! Boo hoo. That's effing awesome. It's the ancient Sad Panda trick. WHERE were all these teachers when I WAS AT SCHOOL?!?! What really gets me is that this is an A-level (or equivalent) exam paper. I don't know about you guys, but my maths teacher at this level was a real dragon - he would have destroyed me for anything like this. Uhh it's the same hand writing so FAIL!! 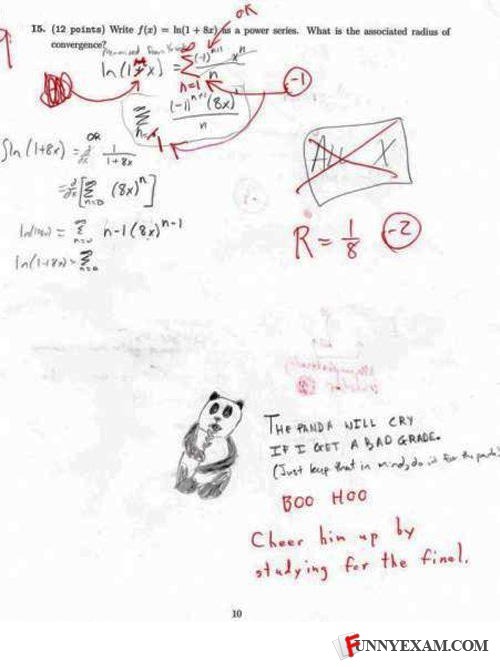 The panda will cry if I get a bad grade. The panda will also cry if I study. Please help me! and the teacher wins the battle. LMAO! Teacher showed him wassup! Pimmmmpin! LOL,my friend did something like this before! i wish our teacher also has a sense of humor. Do it for the Panda. HAHA. Why did the elephant cross the river? Boy: When you burst through the asphalt, emerging from the depths of hell. "Which would come first, summer or James May?" ©2008-2019 Funny Exams. All rights reserved.